Posted on 31 August 2018. The Fighting Scots baseball team had quite an amazing continuation of their season after classes ended for the 2017-2018 school year. The Scots, 34-6 overall, 16-2 in the NCAC were already crowned the regular season NCAC champions, earning themselves the no. 1 seed heading into the NCAC tournament. What transpired at that point culminated in a roller coaster ride that created a finish that only five other Wooster baseball teams have ever experienced. The journey started in Chillicothe, Ohio, headed north to Adrian, Mich. and finally came to its ultimate destination in Appleton, Wis.
At the NCAC tournament in Chillicothe, the top-seeded Scots ran into a tremendous obstacle, as the Wabash Little Giants, the no. 3 seed, defeated Wooster twice to take home the NCAC tournament title. However, the tournament runner-ups, the Wooster squad, was a lock to receive an at-large bid into the NCAA tournament. The only unknown was where they would be traveling to next. The at-large bid sent the Scots to Adrian, Mich. as the no.1 seed in the Mideast regional tournament. 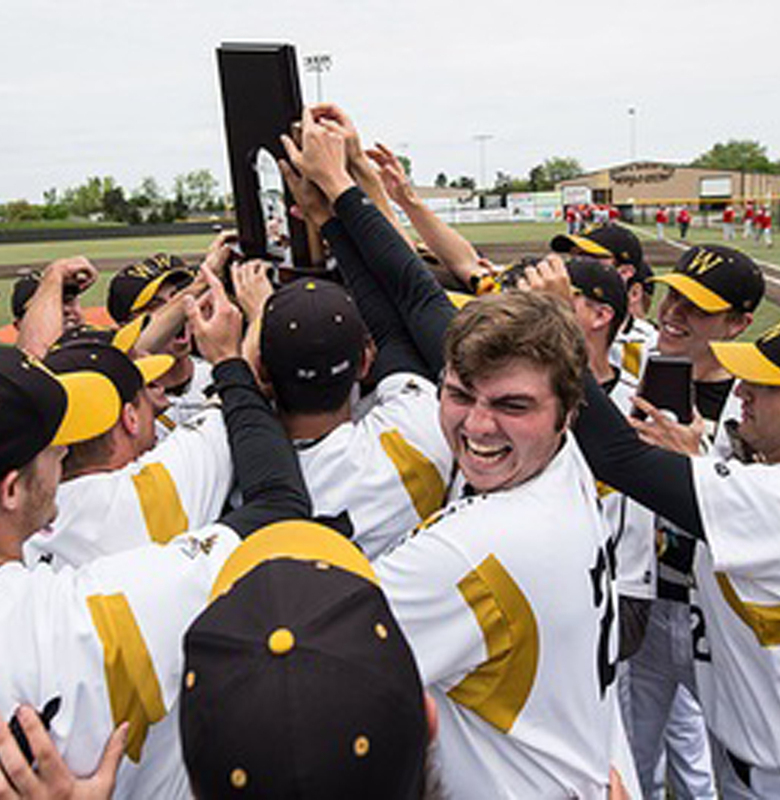 By winning all four games in Michigan, Wooster secured the berth to the NCAA D3 World Series in Appleton, Wis. Along the way, the Scots were able to turn the tables on the Wabash Little Giants defeating them twice by identical 4-2 scores, first in the opening round and lastly in the first final, to win the regional title. In the opening game of the regional, Chandler Dippman ’19 threw an impressive game on the mound. Dippman contributed 10 hits, struck out six and did not walk a batter in the 119-pitch game he produced. The Fighting Scots were able to contribute early offense scoring two runs in the first inning off the bat of Dan Harwood ’20 driving in both Jake Stuursma ’19 and Michael Wielansky ’19, who reached base by a hit-by-pitch and an error. With this RBI, Wielansky had reached home plate 70 times, a feat that hadn’t been overcame since 2009 by alumnus Sean Karpen ’09. Alongside this achievement, Wielansky was named the second player in Division III history to have at least 200 runs, 200 hits and 150 RBIs before their senior year. Wooster led 4-1 after three innings and Dippman was able to hold off their opponent to take home the win. Over the next two days, the Scots handled their business in dominating fashion, defeating the Shenandoah Hornets 13-5 and the host Adrian Bulldogs 17-4, setting up another matchup with the familiar NCAC foe Wabash Little Giants. These two conference-rivals would be meeting for the fourth time in 10 days, this time to determine the champion of the Mideast Regional. Between the two of them, they pitched five 2/3 innings of one-run baseball with Hill earning the save. Nanak Saran ’18 then came aboard and got the win. Wooster trailed 1-0 into the sixth inning when the Little Giants defense struggled, committing two errors. This effort lead to two unearned runs allowing the Scots to take a lead that they wouldn’t relinquish, hanging on for the 4-2 victory and sending them to Appleton, Wis. for their sixth-ever D3 College World Series.